Thing that's crazy about these sort of low-budget action-flicks is that they actually often feature hardly any action or excitement in it. So what's left? A thrilling story? Stellar acting performances? Well, no. At least not in this case. 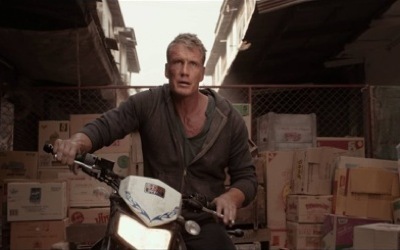 Why on Earth would you cast Dolph Lundgren in your movie if you don't intend to fill your movie to the brim with explosions, gunfire and fist fights. I mean, if you're able to get Dolph Lundgren then use him! And use him right. That doesn't mean letting him act out serious emotions and giving him more than 5 lines of dialog. He mumbles his way through the movie as usual and isn't ever really given the opportunity to shine as an action-star. It's silly to see how this movie is trying to be a story-driven one, rather than a crazy, fun and entertaining one. And what is the story even about? No really, that's a question; what is it all supposed to be about? I really don't know. Something to do with gangs, a corrupt senator, the CIA. You know, the usual. With as a problem that the story never plays out very well. It's a poorly constructed movie, story-wise. There's never a good buildup and the characters are left dangling as well. Who are all these people? Why are they here and what do they want? At least you're somewhat able to tell the good- and bad guys apart but that's about the only thing that's ever made clear properly in the story. But I honestly doubt this movie would have been much better if it indeed featured some more action in it. I say this because the action that's in the movie is hardly anything good to begin with. It's actually shockingly poorly shot and 'clumsily' is another word that immediately comes to mind. Sure, a lot of this could be put on the movie its low budget but then again; is a $6,000,000 really a low budget movie to begin with? Surely they could have put its money to a better use and it really doesn't excuse the movie its poor story and approach and its lack of fun, excitement and creativity. I know there is a pretty big market for these type of movies and sure, some people are less demanding than others but there really is no way anyone could ever say that this is a good, fun or even remotely exciting movie to watch. At least not with a straight face.